François, T., et al. Congenital Diaphragmatic Hernia and Pulmonary Vein Obstruction. (2016) J Palliat Care Pediatr 1(1): 13- 17. © 2016 François, T. This is an Open access article distributed under the terms of Creative Commons Attribution 4.0 International License. Persistent pulmonary hypertension of the newborn is a common complication of congenital diaphragmatic hernia (CDH).This research describes two cases of right-sided CDH (R-CDH) with a sudden late onset of rapidly progressing and eventually fatal pulmonary vein obstruction. The pathophysiology of pulmonary hypertension (PHT) in CDH and PHT in addition to pulmonary vein stenosis, and the possible differences between R-CDH and left-sided congenital diaphragmatic hernia (L-CDH) are examined and correlated to the presented case histories. Congenital diphragmatic hernia(CDH) is a congenital malformation, characterized by herniation of the abdominal content into the thorax through diaphragmatic defect. CDH is mostly unilateral (98%), with only a minority of right-sided defects (15 - 20%)[1-7]. Most CDH cases are isolated. However, almost 1/3 of the cases are due to a genetic abnormality or can be associated with other structural anomalies[2,8]. Neonatal management consists of gentle ventilation with permissive hypercapnia and late repair. Other treatment options, e.g. extracorporeal membrane oxygenation (ECMO), inotropes, inhaled nitric oxide (iNO) and other vasodilators, can be considered in certain cases but remain rather based on expert opinion than solid evidence. Estimated survival chances range from 50 to 70%, mainly depending on the presence of associated abnormalities; the degree of pulmonary hypoplasia and the degree of pulmonary hypertension (PHT). Survival rates and morbidity in right-sided congenital diaphragmatic hernia (R-CDH) in comparison to mortality and morbidity in left-sided congenital diaphragmatic hernia (L-CDH), have been published with an inconsistency in mortality rate[1,4-6,10-16]. This research describes two cases of R-CDH with an unexpected and fatal outcome because of late onset and progressive PHT related to pulmonary vein obstruction (PVO). The first case was diagnosed, treated and cared for in the University Hospital of Leuven in Belgium and the second case in the Hospital Sint-Jan of Bruges in Belgium. The first case concerns a male R-CDH patient, prenatally diagnosed at 26 weeks, with normal array analysis and no other structural anomalies. Lung measurements showed severe lung hypoplasia evidenced by an observed versus expected lung-to-headratio (O/E LHR) of 24%[1,17]. Therefore, a fetoscopic endoluminal tracheal occlusion (FETO) was performed at 29 weeks and 3 days (29w3/7). This was complicated by premature rupture of membranes at 31w3/7, and because of preterm labour full course of betamethasone was administered and the balloon was fetoscopically removed. The boy was delivered vaginally at a postmenstrual age (PMA) of 31w5/7. His birth weight was 1720 g. He was sedated (Apgar score 5 at 5 min), intubated and ventilated. In the first 24 h, preductal saturation was 90 - 94%, alveolar-arterial O2 gradient was 17kPA, and cardiac ultrasound revealed PHT at systemic pressures. He was ventilated with high frequency oscillation in combination with iNO. After stabilization, surgical patch augmented repair was performed on the fifth day of life. The postoperative course was complicated by a hemothorax and a pneumopericardium. Hence, he needed a surgical intervention on the ninth day with ductal clipping simultaneously because of a mini persistent open ductus. Subsequently, he developed a left-sided peripheral pulmonary (arterial) stenosis, yet without PHT. The ventilation could progressively be weaned with extubation on day 19 and further support with nasal continuous positive airway pressure (nCPAP) without supplemental oxygen. Enteral feeding was initiated at day 14, but was difficult to increase because of recurrence of the hernia with herniation of the stomach. After performing a Nissen fundoplication on day 46, enteral feeding was much more successful. Ten days postoperatively, an acute abdomen occurred due to a volvulus with strangulation and small bowel perforation. Multiple interventions were necessary because of wound closure problems and eventually he needed a partial small bowel resection. During that period, consecutive cardiac ultrasound examinations determined a structural and morphological normal heart, with physiological tricuspid insufficiency (TI) and low right ventricle (RV) pressures. On day 88, a definitive closure of the abdomen caused oxygenation problems, which required an increase of the ventilation pressure. Progressively, the boy developed severe suprasystemic PHT (TI 2-3/4 with a transpulmonary pressure gradient (TPG) of 81 mmHg and RV hypertrophy by day 102) for which iNO and later on Sildenafil were started, with a poor response. On day 105, a stenosis of the left PV was diagnosed on a computed tomography (CT) scan of the chest (Figure 1) and a cardiac catheterization. Since the PHT was fast progressive and caused respiratory insufficiency, a repair of the PV obstruction was performed on day 132 without any perioperative complications. Postoperatively, the boy could not immediately be weaned off the ECMO, resulting in an increased ventilator and circulatory support. This need persisted and the baby died at the age of 5 months after withdrawal of intensive care. 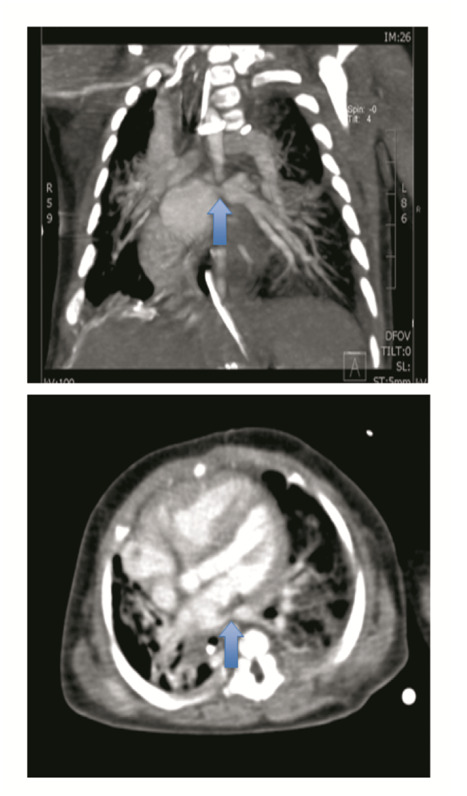 Figure 1: Spiral CT thorax with contrast on day 105 in case 1, illustrates a stenosis of the left lower pulmonary vein (arrow) and a manifest right ventricle dilation. The second case concerns a term born (PMA 38w4/7, birth weight 3200 g) female infant. She was born by an urgent cesarean section because of fetal distress during labour. She had a moderate neonatal start (Apgar score 6 at 5 min). Because of a persistent respiratory distress and marginal oxygenation (saturation of almost 90%) with FiO2 35 - 40%, a chest X-ray was taken which revealed a right-sided CDH with liver herniation. Subsequently, she was intubated and gently ventilated according to the current guidelines for neonatal management. A cardiac ultrasound was performed shortly after birth and revealed a normal heart without signs of PHT. A surgical patch augmented repair was performed on day 4 without any perioperative complications. Minimal enteral feeding was started 3 days later. Five days postoperative, she could be successfully weaned off the ventilator, followed by a progressive pulmonary improvement, with several days of nCPAP, then high flow oxygen therapy with FiO2 40% and eventually low flow that could be weaned to 0.1 liter per minute (l pm). A cardiac ultrasound at day 8 and 15 again showed a structural and morphological normal heart, with a physiological TI and low RV pressures. Enteral feeding was difficult to increase because of nausea and vomiting. Nasoduodenal feeding was started and increased to full enteral feeding on day 16. Hence, the feeding problems persisted with failure to thrive. After the fourth week of life, the pulmonary state changed with progressively increasing oxygen needs up to 0.5 l pm at day 54. The differential diagnosis at that time was gastro-esophageal reflux (GER) with cardiopulmonary impact, evolving chronic lung disease or progressive PHT. Subsequently, the GER and lung disease were treated. Nevertheless, the oxygen need continued to increase and the girl got acute events of desaturation and compromised circulation. A cardiac ultrasound on day 57, at PMA 46w, revealed a profound right ventricular dilation, with a TI and a TPG of almost 105 mmHg. Additionally, the ultrasound suggested PVO with turbulences in the four pulmonary veins, a continuous flow of 2 meter per second (m/s) and a high pressure drop in the left PV (Figure 2). Diuretics, iNO and Sildenafil therapy did not give any significant improvement. A diagnostic heart catheterization was performed, which confirmed the PVO. Due to the severe and progressive disease, and the dismal prognosis, surgery was not considered and the girl died after 69 days. 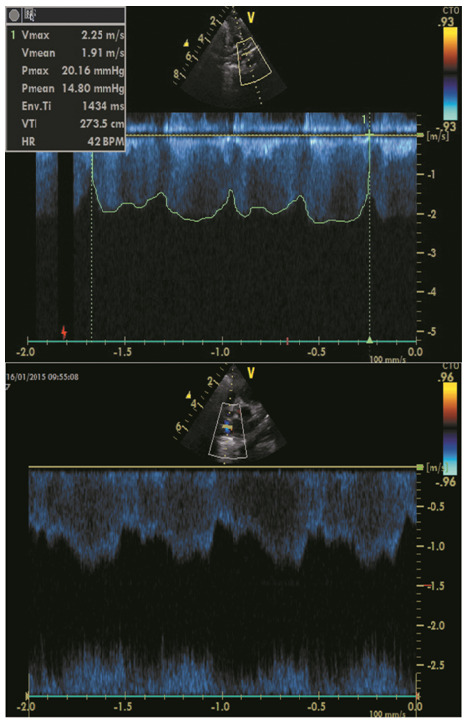 Figure 2: Cardiac ultrasound on day 57 in case 2 revealing a continuous wave with turbulent flow and increased flow velocity (> 1.6 m/sec) in the pulmonary veins which is seen on cardiac ultrasound on day 57 in case 2, suggesting pulmonary venous obstruction in the 4 veins (upper part: probe of ultrasound revealing the flow in the left lower pulmonary vein; lower part: probe of ultrasound revealing the flow in the right lower pulmonary vein). Both presented cases illustrate an infant with R-CDH with an initially fairly straightforward course and relatively fast weaning from ventilation. Normal cardiac ultrasounds and normal pulmonary artery pressures were determined in both cases on day 8. The first baby developed severe and progressive PHT after severe surgical gastrointestinal complications with recurrence of the hernia, necessitating a prolonged period of positive pressure ventilation. A pulmonary vein obstruction became obvious on day 105. The second baby had increasing oxygen demands from day 28 on. Cardiac ultrasound revealed PVO on day 57 and this was confirmed on cardiac catheterization. Thus, both cases were characterized by late-onset very aggressive venous PHT. It is known that pulmonary hypertension in CDH is caused by an altered vascular structure in the hypoplastic lung in combination with an altered vasoreactivity and altered response to treatment with vasodilator drugs due to a dysregulation between vasorelaxing and vasoconstricting factors[18-21]. We can only speculate on the cause of the severe PHT with pulmonary vein obstruction in our cases, because there are only few similar cases reported in literature. Congenital pulmonary vein obstruction or stenosis has been described in rare cases (estimated incidence of almost 2 in 100.000), with a progression towards pulmonary venous hypertension and associated arterial hypertension. Typically, the obstruction is rapidly progressive with a normal first cardiac echography because the disease is usually mild and undetectable on ultrasound immediately postnatally. Mainly based on case series, it is known that the prognosis of PV stenosis is mostly lethal, especially when all four of the pulmonary veins are affected[22-26]. The treatment options for pulmonary vein obstruction (congenital or acquired) are still experimental: heart catheterization with balloon dilatation, surgical repair with venoplasty, intravascular stenting, heart and/or lung transplantation[22-25]. Acquired PVS is associated with prematurity, bronchopulmonary dysplasia and intracardiac shunt lesions (30 - 80%). Altered blood flow in the lungs of fetuses with CDH and congenital heart disease was documented and could possibly cause vascular wall changes. Distortion of the mediastinal structures and vessels is occasionally seen in CDH and one might speculate that this can lead to vascular damage with evolution toward stenosis/obstruction. However, in both cases presented in this study, cardiac ultrasounds in the first weeks revealed normal non-obstructive venous return, so the PVO in this cases could still be congenital, due to difficulties in diagnosing congenital PV stenosis early postnatal, or it could be in association with the CDH. Furthermore, it is remarkable that both cases in this research were R-CDH, knowing that R-CDH is much less frequent. When consulting the database of the CDH patients admitted to the NICU of Leuven, from the start of the FETO pilot in January 2002 until December 2015, there were 151 live born infants with CDH with 28 cases of R-CDH (18,5%). About half of the live born CDH patients received a FETO procedure (77 vs. 74). Overall survival was of 62% (93/151), with a survival rate of 80% in the group without FETO procedure versus 44% in the FETO group (p < 0,05). Additionally, a better prognosis was calculated for L-CDH compared to R-CDH patients (69% vs. 32%, p < 0,05). Almost all R-CDH had a low O/E LHR before birth and thus had severe lung hypoplasia (23/28). The two cases presented here were the only documented CDH cases in the NICU of Leuven and Bruges, since start of the CDH databases, presenting with late-onset severe PHT. Nor were there any other cases of pulmonary venous obstruction. The majority of the other non-survivors in the CDH database of Leuven died in the early neonatal phase (< 48 hours), 2 died after 14 days (with a course of ECMO because of early severe PHT), and one non-survivor was a premature born baby (31 weeks) who died after 31 days (a combination of lung hypoplasia and PHT). After interpretation of those data, it is obvious that the severity of PHT is an important determinant of survival in all CDH patients. Moreover, Dillon et al. revealed that patients with normal PAPs within the first three weeks of life have a predicted survival of 100%. However, the survival chance diminishes to only 50% if PHT is not resolved in the first three weeks of life and the mortality will be 100% if PAPs stay (supra) systemic until the third week of life. Also, Lusk et al. concluded that persistence of PHT in the second week of life was associated with a higher morbidity and mortality, although severe PHT after three weeks of life was not fatal in all cases. Moreover, PHT at 1 month of age can be used as a predictor of mortality at discharge, namely; 1.4% for a mild PHT, 7.4% for a moderate and 56% for a severe PHT. All these estimated survival rates were based on data of mostly L-CDH, although in one study R-CDH was associated with more persistent PHT but without statistical significance. In addition, it has been suggested that L-CDH and R-CDH are two different entities with different pathogenesis. Other prognostic factors for CDH, next to pulmonary hypertension, have been proposed but most data are based on a predominantly L-CDH population. Hence, prognostic factors for survival in L-CDH cannot simply be used for R-CDH. R-CDH patients with severe pulmonary hypoplasia (low O/E LHR before birth) seem to have a poorer prognosis than L-CDH babies with the same lung volumes[1,17]. For isolated R-CDH, both prenatal diagnosis and delayed postnatal repair seem significant prognostic factors, although data about morbidity and mortality in literature are not consistent[3-6,10,11,26,28]. Both R-CDH cases, presented in this research, had a delayed postnatal repair and the PAPs were normal in the first three weeks of life. Thus, based on literature and the data of the CDH database of Leuven, a good prognosis was expected in both cases. To conclude, the fatal outcome of these infants with R-CDH was due to pulmonary vein obstruction with rapidly progressive PHT, despite the well-documented normalization of pulmonary artery pressures during the first weeks of life. Therefore, serial cardiac ultrasounds with special attention to the pulmonary venous return are warranted in infants with CDH, especially when there are sudden changes in the clinical status. In infants with congenital diaphragmatic hernia, persistent pulmonary hypertension is a major determinant of mortality and morbidity. In most cases, pulmonary hypertension is early-onset. Hence, little is known about late-onset pulmonary hypertension and pulmonary venous hypertension. There were no conflicts of interest concerning the writing, submission or conclusion of this manuscript. There was no funding for this manuscript. 1. DeKoninck, P., Gomez, O., Sandaite, I., et al. Right-sided congenital diaphragmatic hernia in a decade of fetal surgery. (2015) BJOG 122(7): 940-946. 2. Losty, P.D., Vanamo, K., Rintala, R.J., et al. Congenital Diaphragmatic Hernia – Does the Side of the Defect Influence the Incidence of Associated Malformations? (1998) J Pediatr Surg 33(3): 507-510. 3. Skari, H., Bjornland, K., Haugen, G., et al. Congenital Diaphragmatic Hernia: A Meta-Analysis of Mortality Factors. (2000) J Pediatr Surg 35(8): 1187-1197. 4. Schaible, T., Kohl, T., Reinshage, K., et al. Right- versus Left-sided congenital diaphragmatic hernia-postnatal outcome at a specialized tertiary care center. (2012) Pediatr Crit Care Med 13(1): 66-67. 5. Duess, J.W., Zani-Ruttenstock, E.M., Garriboli, M., et al. Outcome of right-sided diaphragmatic hernia repair: a multicenter study. (2015) Pediatr Surg Int 31(5): 465-471. 6. Fisher, J.C., Jefferson, R.A., Arkovitz, M.S., et al. Redefining outcomes in right congenital diaphragmatic hernia. (2008) J Pediatr Surg 43(2): 373-379. 7. de Buys Roessingh, A.S., Dinh-Xuan, A.T. Congenital diaphragmatic hernia: current status and review of the literature. (2009) Eur J Pediatr 168(4): 393-406. 8. Tovar, J.A. Congenital diaphragmatic hernia. (2012) Orphanet J Rare Dis 7: 1. 9. Snoeck, K., Reiss, I., Greenough, A., et al. Standardized Postnatal Management of Infants with Congenital Diaphragmatic Hernia in Europe: The CDH EURO Consortium Consensus – 2015 Update. (2016) Neonatology 110(1): 66-74. 10. Bryner, B.S., Kim, A.C., Khouri, J.S., et al. Right-sided congenital diaphragmatic hernia: high utilization of extracorporeal membrane oxygenation and high survival. (2009) J Pediatr Surg 44(5): 883-887. 11. Jani, P., Bidarkar, S.S., Walker, K., et al. Right-sided congenital diaphragmatic hernia: A tertiary centre’s experience over 25 years. (2013) J Neonatal-Perinatal Med 7(1): 39-45. 12. Wynn, J., Krishnan, U., Aspelund, G., et al. Outcomes of Congenital Diaphragmatic Hernia in the Modern Era of Management. (2013) J Pediatr 163(1): 114-119. 13. Kotecha, S., Barbato, A., Bush, A., et al. Congenital diaphragmatic hernia. (2012) ERJ 39(4): 820-829. 14. Langham, M.R., Kays, D.W., Ledbetter, D.J., et al. Congenital diaphragmatic hernia. Epidemiology and outcome. (1996) Clin Perinatol 23(4): 671-688. 15. Thébaud, B., Tibboel, D. Pulmonary hypertension associated with congenital diaphragmatic hernia. (2009) Cardiol Young 19(1): 49-53. 16. Crankson, S.J., Al Jadaan, S.A., Namshan, M.A., et al. The immediate and long-term outcomes of newborns with congenital diaphragmatic hernia. (2006) Pediatr Surg Int 22(4): 335-340. 17. Jani, J., Nicolaides, K.H., Keller, R.L., et al. Observed to expected lung area to head circumference ratio in the prediction of survival in fetuses with isolated diaphragmatic hernia. (2007) Ultrasound Obstet Gynecol 30(1): 67-71. 18. Mohseni-Bod, H., Bohn, D. Pulmonary hypertension in congenital diaphragmatic hernia. (2007) Semin Pediatr Surg 16(2): 126-133. 19. Pierro, M., Thébaud, B. Understanding and treating pulmonary hypertension in congenital diaphragmatic hernia. (2014) Semin Fetal Neonatal Med 19(6): 357-363. 20. Dillon, P.W., Cilley, R.E., Mauger, D., et al. The relationship of pulmonary artery pressure and survival in congenital diaphragmatic hernia. (2004) J Pediatr Surg 39(3): 307-312. 21. Kinsella, J.P., Ivy, D.D., Abman, S.H. Pulmonary vasodilator therapy in congenital diaphragmatic hernia: acute, late and chronic pulmonary hypertension. (2005) Semin Perinat 29(2): 123-128. 22. Drossner, D.M., Kim, D.W., Maher, K.O., et al. Pulmonary vein stenosis: Prematurity and associated conditions. (2008) Pediatrics 122: e656-e661. 23. Breinholt, J.P., Hawkins, J.A., Minisch, L.A., et al. Pulmonary Vein Stenosis with Normal Connection: Associated Cardiac Abnormalities and Variable Outcome. (1999) Ann Thorac Surg 68(1): 164-168. 24. Holt, D.B., Moller, J.H., Larson, S., et al. Primary pulmonary vein stenosis. (2007) Am J Cardiol 99(4): 568-572. 25. Taira, Y., Yamataka, T., Miyazaki, E., et al. Comparison of the pulmonary vasculature in newborns and stillborns with congenital diaphragmatic hernia. (1998) Pediatr Surg Int 14(1-2): 30-35. 26. Endo, M., Yamaki, S., Ohmi, M., et al. Pulmonary vascular changes induced by congenital obstruction of pulmonary venous return. (2000) Ann Thorac Surg 69(1): 193-197. 27. Fuke, S., Kanzaki, T., Mu, J., et al. Antenatal prediction of pulmonary hypoplasia by acceleration time/ejection time ratio of fetal pulmonary arteries by Doppler blood flow velocimetry. (2003) Am J Obstet Gynecol 188(1): 228-233. 28. Akinkuotu, A.C., Cruz, S.M., Cass, D.L., et al. Revisiting Outcomes of Right Congenital Diaphragmatic Hernia. (2015) J Surg Res 198(2): 413-417. 29. Midrio, P., Gobbi, D., Baldo, V., et al. Right congenital diaphragmatic hernia: an 18-year experience. (2007) J Pediatr Surg 42(3): 517-521. 30. Hedrick, H.L., Crombleholme, T.M., Flake, A.W., et al. Right Congenital Diaphragmatic Hernia: Prenatal Assessment and Outcome. (2004) J Pediatr Surg 39(3): 319-323. 31. Lusk, L.A., Wai, K.C., Moon-Grady, A.J., Steurer MA, Keller RL. Persistence of Pulmonary Hypertension by Echocardiography Predicts Short-Term Outcomes in Congenital Diaphragmatic Hernia. (2015) J Pediatr 166(2): 251-256.